EAST LIVERPOOL–Growing up, East Liverpool senior Gabe Roach served as a ballboy for the varsity boys basketball team, hoping to one day leave his mark on the floor at Potter Fieldhouse. Several years later, he’s secured a permanent spot in the school’s record book. In Friday’s homecoming game against Indian Creek Roach became the eighth member of East Liverpool’s 1,000 point club as the Potters held off the Redskins 71-62. The 6-1 guard needed 26 points for the milestone and got it right on the number by sinking his final free throw of the night with 20 seconds remaining. 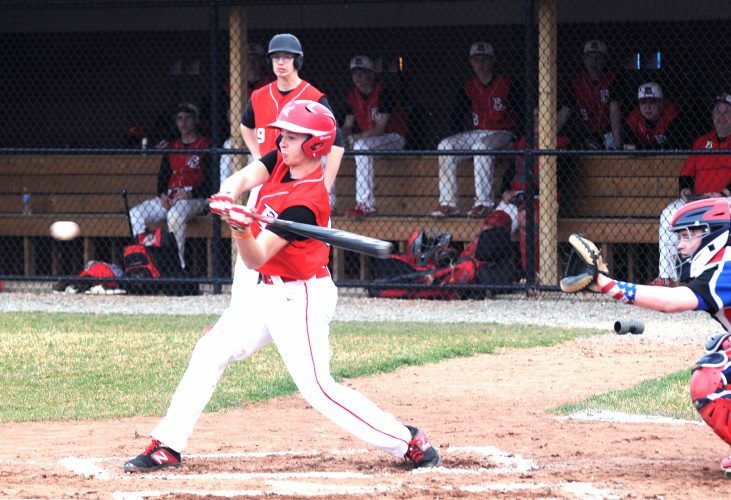 It was the sixth win on a row for the Potters who move to 12-3 overall and complete a perfect run through the Buckeye 8 Athletic League North Division with an 8-0 mark. To top it all off, Roach was celebrating his 18th birthday. Roach began the night determined to let the game come to him, and was focused first and foremost on helping the Potters defeat a rugged Indian Creek squad that took them to overtime back in December. By the time the final minute rolled around, Roach had accumulated 21 points and the Redskins, who were down 66-55, were forced to start fouling. “When I looked up and saw I had 21 and they were fouling, I thought I had a pretty good shot at it. I’m glad it was able to happen,” Roach said. Conley said Roach’s impact on the program over the past four seasons couldn’t be overstated. Indian Creek (8-6, 5-3) fell into a 24-12 hole midway through the second quarter, but the Redskins came alive with a 16-4 run to tie the game at halftime. The Redskins took a couple of brief leads early in the third quarter before the Potters gradually began to take control. Derrick Eakle powered Indian Creek with 21 points, including five three-pointers. 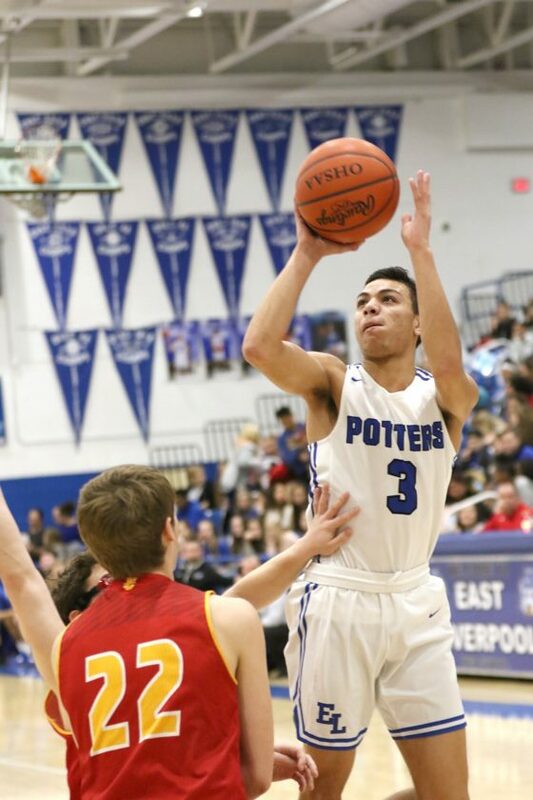 The Potters also got 15 points from Tresean Jackson, who was scoreless in the first half, but hit three key three-pointers after halftime and was six-for-six at the free throw line in the final two minutes to help the Potters seal the deal. James Maxwell added nine points and five rebounds. Brennan O’Hara had eight points. ¯The Potters have secured a spot in the Buckeye 8 championship game against a Buckeye 8 South opponent to be determined on Feb. 2. Conley said “St. Clairsville and Harrison Central are tied for the Buckeye 8 South lead. ¯East Liverpool’s other seven 1,000 point scorers are: Kenny Cunningham, Mike McFarland, Steve Flores, Josh Reed, Brian Kreefer, Marky Tompkins and Isaac Davidson. ¯East Liverpool senior Makayla Newlun was crowned homecoming queen at halftime. Peyton Reed was the king. ¯East Liverpool won the jayvee game 45-25. Zavea Green scored 16 points for the Potters. ¯The Potters are off until Friday when they host Steubenville. INDIAN CREEK SCORING: Brennon Norris 2-4-8, Derrick Eakle 8-0-21, Matt Mamula 0-1-1, Austin Judson 7-3-19, Noah Hilderbrand 0-0-0, Isaiah Vandine 2-4-8, Michael Kuczykowski 2-0-5. TEAM TOTALS: 21, 12-25: 62. EAST LIVERPOOL SCORING: Tresean Jackson 3-6-15, Gabe Roach 9-8-26, Brennan O’Hara 2-4-8, James Maxwell 3-3-9, Timmy Neal 1-1-3, Nick Woodyard 2-2-6, Izaiha Browning 2-0-4. TEAM TOTALS: 22, 24-33: 71. Three-point goals: Indian Creek 8 (Eakle 5, Judson 2, Kuczykowski), East Liverpool 3 (Jackson 3).